The weather this summer has been outstanding. Remarkably little wind, hardly any rain (I’ve recorded less than 1.5 inches in July), and way more sunshine than I can remember in previous summers. The last few days have been more typical Alaska: overcast, periods of light rain, 15 knots of wind. Today was similar but rainier. 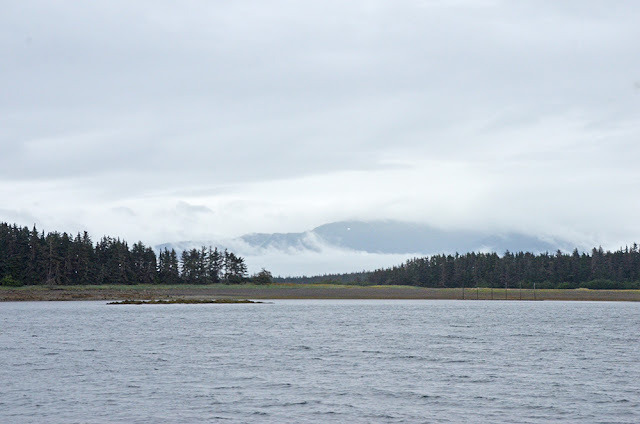 I made the short hop across the southern end of Lynn Canal to Swanson Harbor. Swanson Harbor, like Funter Bay, has a public dock, but I opted to anchor instead. Anchoring is easier, for one thing, since I don’t have to deal with lines and fenders. It’s also quieter, since you’re not near other boats coming and going at odd hours or running gensets constantly. And it’s more scenic, since the view shifts as the boat swings around. Unlike the anchorages where I’ve spent most of the summer, the land around Swanson Harbor is low-lying. The bushes and trees on shore look like they’ve been shaped by storms. It’s scenic, but in a wholly different way than the fjords and mountain vistas I’ve become accustomed to. Given the weather, I never even got in the dinghy to explore, and I hardly took any pictures. Suffice it to say, Swanson Harbor is a convenient stop but hardly a highlight of the trip.